This poster hanging set is perfect for display systems of small or large graphics or banners from overhead at your retail establishment. 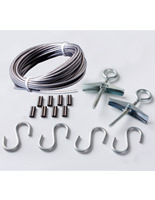 The set of sign hardware comes with 2 sections of 18” nylon line, 4 S-hooks for attaching frames, 2 toggle bolts to suspend from plaster ceilings, and 2 clamps to hang from drop ceilings. 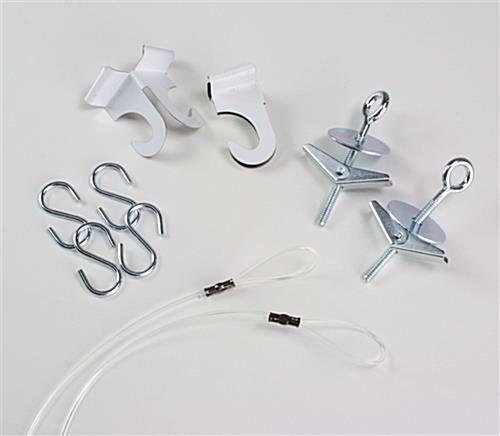 The hanging set that is very affordable allows every business to purchase the mounting kit to use somewhere in their store. 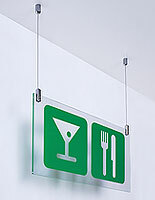 The overhead system allows companies to place other advertising on walls or attach displays to vertical surfaces. 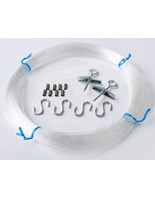 The set is easy to install and great for business owners that don’t mind do-it-yourself projects. 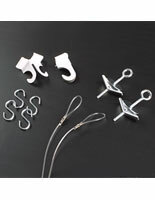 The sign hardware looks great in any setting because of the clear line that isn’t easily visible to customers allowing them to focus on presented graphics.